Electronic dance music is having "an identity crisis", Daft Punk have declared. In their first interview to promote their new album Random Access Memories, due next month, the French duo claimed EDM "is in its comfort zone". "It's not moving one inch," Thomas Bangalter complained. "That's not what artists are supposed to do." After months of teases and stunts, Daft Punk have finally started talking, revealing details of their fourth album in a conversation with Rolling Stone. Apparently the duo flew into California for the Coachella festival – not to perform but to sneak around backstage, anonymous without their robot suits, and to watch the world premiere of Random Access Memories' new teaser, which screened for the Indio masses. Whereas most modern marketing campaigns rely on online widgets and exclusives, Daft Punk want to promote their new LP by giving fans "real-life" experiences – catching a surprise TV ad, or hearing the album at an Australian agricultural fair. "When you drive on the Sunset Strip and see [giant] billboards, it's more magical than a banner ad," Bangalter explained. Random Access Memories got off to a bumpy start. 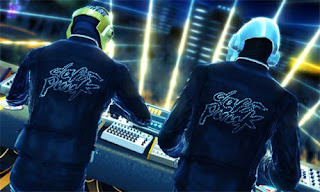 When Bangalter and Guy-Manuel de Homem-Christo began working on their new album, in 2008, it felt like they were working on "autopilot". they told Rolling Stone. "There was a sense of searching for a record we hadn't done," Bangalter said. The breakthrough came when they started experimenting with live musicians and "[recreating] what we used to do with machines and samplers, but with people". While Daft Punk still use vintage vocoders and a custom modular synth, the record has hardly any samples. "[We tried] to make robotic voices sound the most human they've ever sounded, in terms of expressivity and emotion." Accordingly, lots of musicians became involved. Besides the big names like Nile Rodgers, Pharrell, the Strokes' Julian Casablancas, Giorgio Moroder and Panda Bear, the Frenchmen procured "top-notch session players". "All these guys were tripping on meeting again and playing together again," said De Homem-Christo. Although Kanye West does not appear on Random Access Memories, Daft Punk have worked with the Stronger rapper on his new record. "He's a good friend," De Homem-Christo said. By working with real people, in real studios, Daft Punk said they hope to shake up the complacent genre of EDM. "Today, electronic music is made in airports and hotel rooms, by DJs traveling," Bangalter said. "It has a sense of movement, maybe, but it's not the same vibe as going into these studios that contain specific things … You hear a song – whose track is it? There's no signature." • Random Access Memories will be released by Columbia on 12 May.